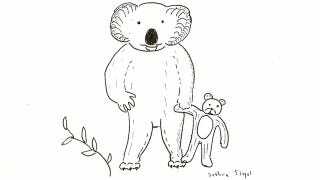 Koalas Can Have Teddy Bears Too! Josh Siegel brings you animal art every Monday. Add your own requests in the comments, and maybe Josh will draw an animal for you. For Koala "maybe a koala with a Teddy bear." Fun fact: Koala bears aren't really koalas at all, but a species of lizard. It's a fact!